Barrow chairman Brian Keen has warned supporters that the club may be forced to sell players to balance their finances amid falling attendances. The Bluebirds had an average of 1,260 in 2011-12 but so far have recorded 1,041 as a highest figure, with the gate against Kidderminster down to 778. "It can't go on with gates of 700," Keen told BBC Radio Cumbria. 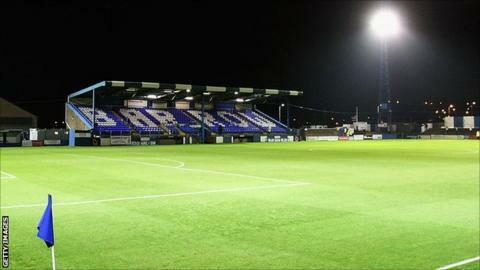 "I'll have to move (players on) because Barrow is a business, not just on the football park, and gates are down." Keen added: "The only way I can see us getting through it is if the fans will help us to get through this period, which I'm sure they will." On the field, Barrow have begun the season with four defeats and two draws from their six games following injuries to several key players. Although boss Dave Bayliss was able to bring in additions, Keen is hopeful of acquiring similar aid off the pitch. "We got kicked before we got started, three of our main summer signings were injured in pre-season, so we've had to go out and find new players," he added. "It's not just us suffering with lower gates, the business world is suffering, the businesses who have been so good to us, everyone is feeling the pinch. "We're going to the fans saying 'help us' we need voluntary workers, skilled people like electricians and plumbers to help us maintain the ground and save lots of money."